OK – I’ve had enough of this medically induced vacation from the Misadventures in Remodeling blog. Did you think I would give up? Oh, no I’m too foolish to do a sensible thing like that – nope I’m gonna get this place finished if it kills me. Let me rephrase that (as it almost did kill me) – I will do the best I can as long as the renovation Gods will allow. Five surgeries later I walk like an impaired penguin – and going up a ladder is one half step at a time – I still have one good leg, so why not? It’s been seven months since I have been able to walk into this place – it’s like a time capsule left just the way it was in June of last year. Let’s start on the ground first, shall we? 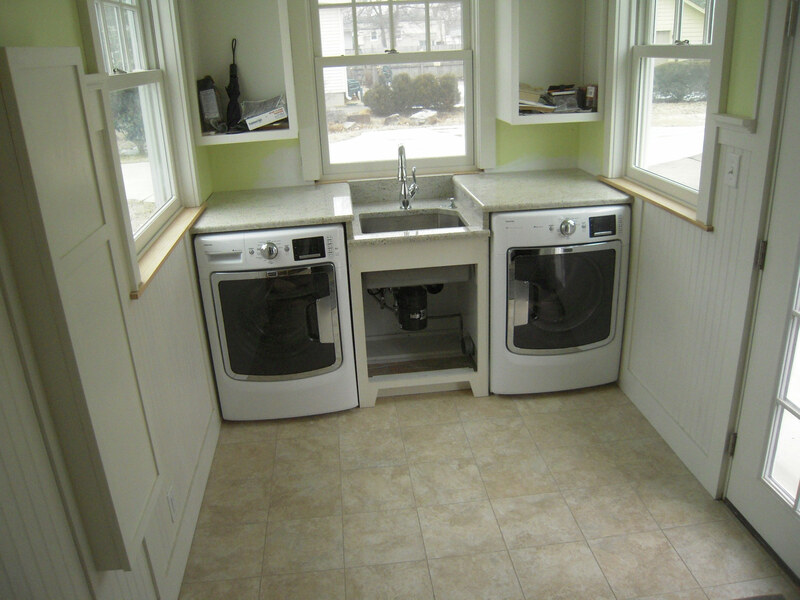 Here’s the mud room – the washer was pulled out in the middle of the room while I fiddled with getting hoses and other parts for the Floodstop system to prevent water leaks from a failed washing machine hose. Since the shut off valves for the washer and steam dryer are not accessible, I have an additional set of shut off valves in the basement – which is good – but then it’s kind of a pain to go downstairs and shut them off after every use, so I decided to add a Floodstop system. 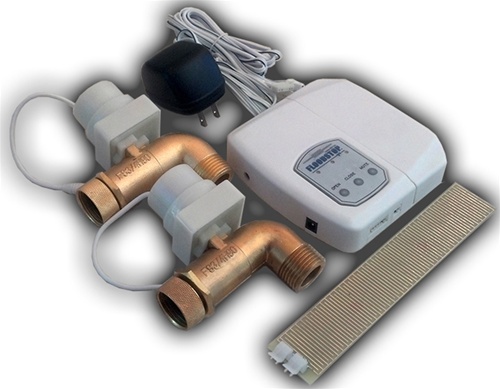 The system consists of two servo motor valves that close in the event of a water leak. 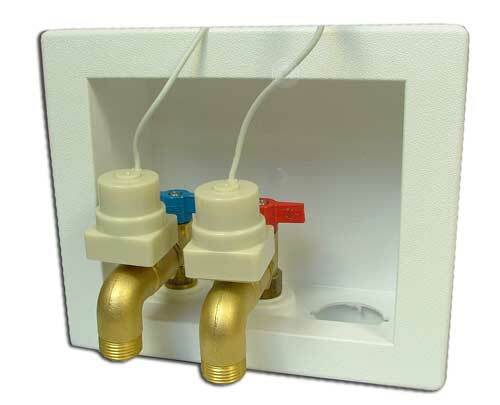 The motorized valves are connected to the hot & cold supplies. 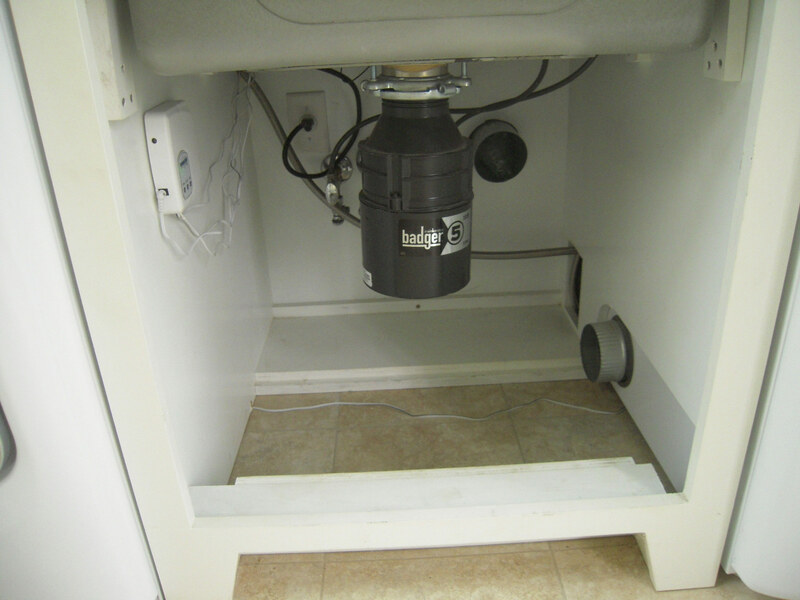 Originally the steam dryer water supply was plumbed under the sink, but that wouldn’t allow leak protection. I had to put a ‘y’ on the cold supply to split the water supply to the dryer. 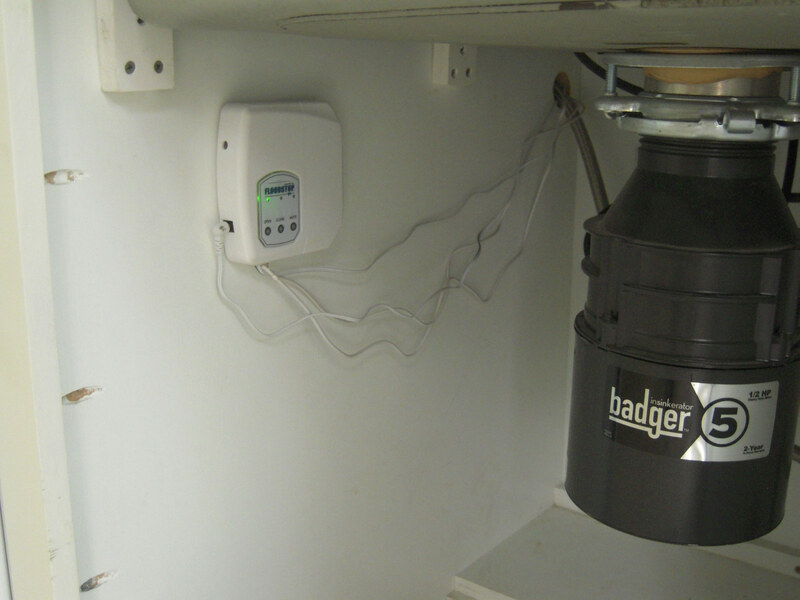 Floor sensors are placed on the floor under the machines and if they detect water they automatically shut the supply valves. The control is mounted where you can reset or manually control the valves. Here it’s mounted under my mudroom sink cabinet. Since there is a water supply to the steam dryer, I ran a sensor under the dryer too. 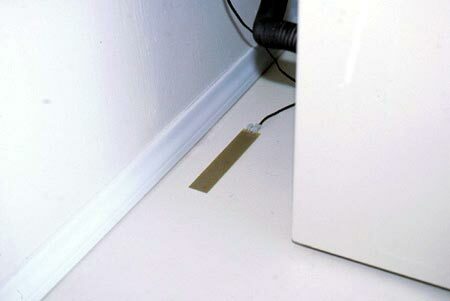 The cabinet floor will conceal the wires. I thought this would be a pretty safe project, being on the floor – but I ended up hurting my leg and back to the doctor I went. But a couple of days later it’s ladder time! All with the blessings of my doctors who said “If you can do it – then do it”. OK.
Now back to the sunroom. Ceiling insulation time. I had placed ventilation chutes and one layer of unfaced R19 fiberglass in the rafter bays. 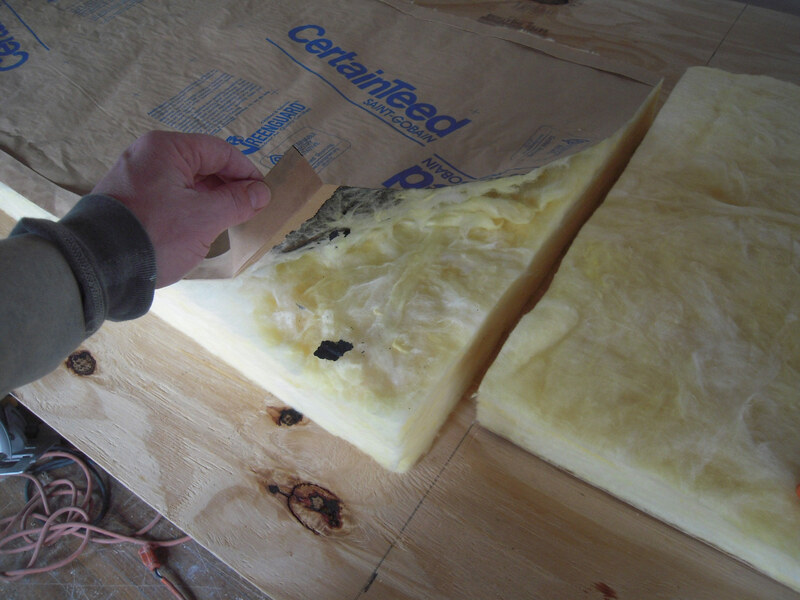 I couldn’t find a thicker r-value insulation in my area so I decided to add another r-13 fiberglass layer – the problem is no one stocks unfaced 23.5″ wide R-13 – so I had to get the faced type. 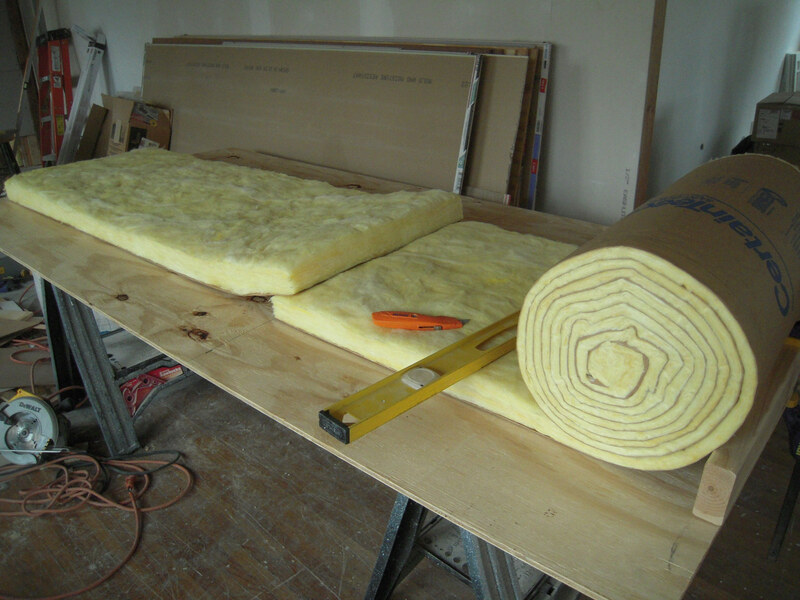 Now you have to be very careful not to create a ‘moisture sandwich” (two vapor barriers) within the same space. I had to peel the paper (the vapor barrier) off this second layer because of the foam insulation that will be going over this. Also, I needed to make this layer a little thinner because my rafters are 2X10 and the effective thickness of insulation should be around 8″ thick. 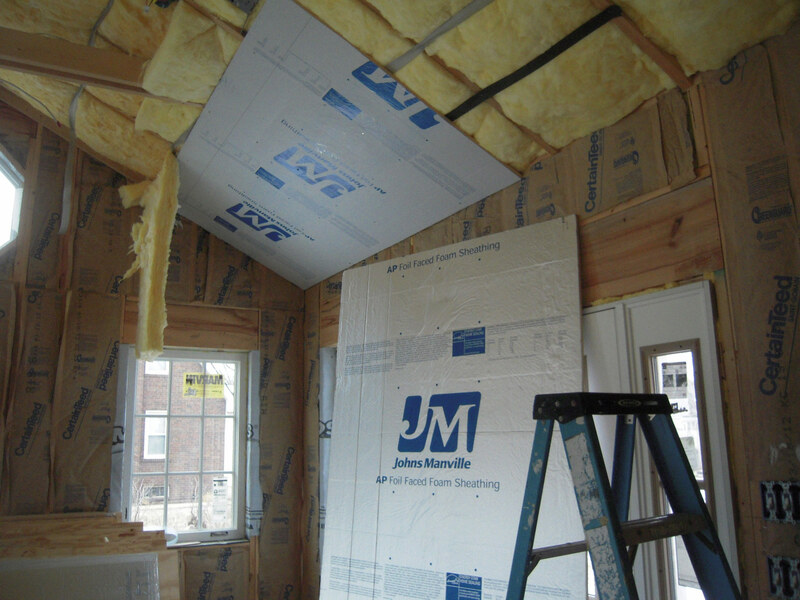 Here you can see the second layer of insulation going in. The straps are used to hold it in place. This is foil-faced 3/4″ foamboard going over the unfaced fiberglass. The foil face goes towards the exterior to act as a radiant barrier. 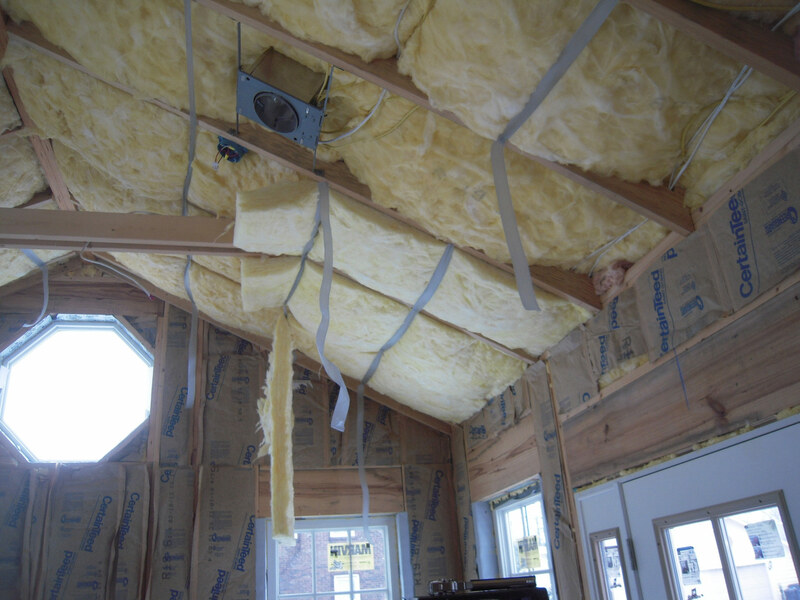 The foamboard acts as the vapor barrier, that’s why the fiberglass paper had to be removed. That’s it for now – not exciting, nor pretty stuff – but we’ll get there.